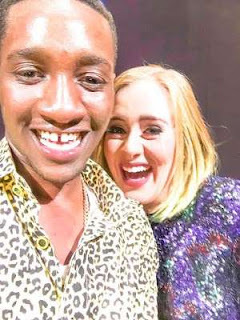 A 21-year-old Nigerian fan of Adele's has been mind blown after accidentally kissing the singer while on stage with her. The ecstatic fan who flew all the way from Nigeria to Vancouver, Canada to see the "Hello" crooner perform on Thursday, July 21, mistakenly brushed her lips with his when she pulled him up on stage. After Adele discovered that the young man had spent 200,000 in his quest to see her preform, she had decided to give him a hug, during which the awkward kiss took place. Adele said jokingly, “Oh my god, I haven’t been kissed by another man in like six years! He just snogged me!" The excited young man with Snapchat name, Wisdom, was quick to shared the unforgettable moment via social media.